Multiparticulates (MPs) have been extensively utilized in specialized applications given their dosing flexibility; ability to incorporate modified-release approaches (eg, taste-masking); and safety considerations (eg, guarding against dose-dumping issues versus monolithic formats). The continued move toward more patient-centric medicines is expected to accelerate this trend, given the rising geriatric population and regulatory requirements for specialized pediatric formulations. 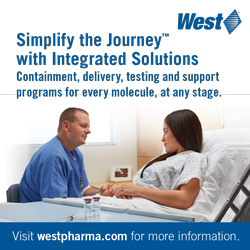 In addition to addressing the issues facing many compounds today – low aqueous solubility and more specialized target product profiles, formulators must also increasingly consider palatability issues (eg, taste, odor, mouthfeel); ease of administration by caregivers; and dosing flexibility across patient populations and subgroups. Lipid multiparticulates (LMPs) in particular offer an attractive formulation option for pediatric use. This platform technology has demonstrated efficacy, combining the flexibility and safety aspects of oral multiparticulates, the advantages of lipidic delivery systems, and compatibility with a wide range of convenient delivery systems.5 LMPs are made by a solvent-free melt-spray-congeal (MSC) process using precedented, lipid-based excipients with good safety profiles. Because LMPs are solid and lipid-based, no preservatives are required to prevent microbial growth. API dissolution rate is controlled by varying excipient composition, making both immediate- and controlled-release formulations achievable. The following focuses on a controlled-release LMP formulation to identify optimum annealing conditions and to better understand the annealing mechanism. Controlled-release dosage forms for pediatric patients are increasingly needed due to regulatory requirements when controlled-release product enhancements are used for adult products as part of a lifecycle management strategy. Children are not able to swallow controlled-release tablets and therefore require an MP-based dosage form. Annealing addresses an issue that can affect the dissolution performance of controlled-release LMPs after their manufacture. Specifically, we investigated whether annealing could be used to improve the stability of LMPs after congealing, accelerating thermodynamic forces that can result in phase separation and varying dissolution rates. LMPs were prepared using an MSC process and characterized after annealing at high temperature and relative humidity (RH). Results showed that annealing could be used to accelerate kinetic transitions of the lipid matrix from high-energy forms (present after manufacture) to lower-energy polymorphs that are thermodynamically more stable. This transition should prevent changes in the dissolution profile of the LMPs after manufacture. Immediate-release or controlled-release profiles can be achieved without the need for rate-controlling coatings. Modified-release coatings – to achieve taste-masking, enteric protection, or delayed release, for example – can be applied using a standard fluid bed coater to meet the desired release profile. Either coated or uncoated, LMPs are well- suited for use in numerous types of dosage forms, including novel capsules that can be snapped open to sprinkle the contents, sachets, orally disintegrating tablets (ODTs), and liquids, depending on the target product profile. The nature of the excipients used in controlled-release LMPs warrant annealing. The majority of the LMPs consist of a lipidic wax matrix, and the release profile is adjusted using a dissolution enhancer (ie, a pore former). As the molten feed containing the dispersed crystalline API is atomized by the rotating disk, drops form, which rapidly congeal, encapsulating the crystalline drug in a mixed-phase form of partially crystalline excipients. These excipients are in a high-energy, less stable form because of the rapid congealing and, thus, are thermodynamically driven to change form. Over time, the lipidic wax matrix and dissolution enhancer are susceptible to phase separation and recrystallization of different polymorphs, which can alter the dissolution profile of the API. Annealing is thought to occur through two primary mechanisms. First, upon rapid congealing, portions of the dissolution enhancer (poloxamer) can become kinetically trapped in the semi-crystalline lipid domains. 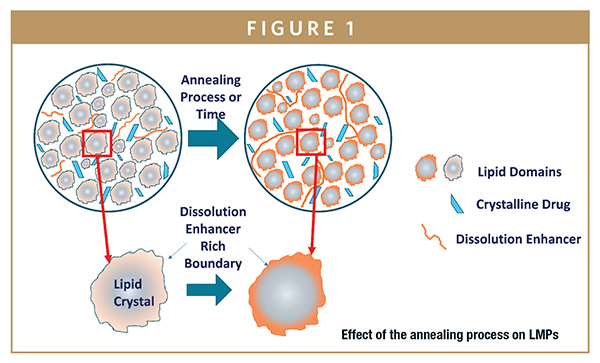 As the lipid matrix crystallizes during annealing, the dissolution enhancer is excluded from the crystal and is pushed toward the grain boundaries. On annealing, the dissolution enhancer rearranges and forms more organized structures around matrix crystals. This rearrangement forms a porous network of hydrophilic domains that allows water to penetrate the LMP and drug to release. The goal of this study was to investigate how the state and morphology of the lipidic wax matrix changes upon annealing and to evaluate the effect of those changes on the resulting dissolution rate. In-depth knowledge of the annealing process provides an opportunity to minimize the stability risk associated with alteration of the target release rate in LMPs after their manufacture. Placebo LMPs and thin films were composed of a lipidic wax matrix (ie, glyceryl dibehenate [GDB], [Compritol® 888 ATO]) and a dissolution enhancer (ie, poloxamer 407, [Kolliphor® P407]) at three poloxamer loadings: 5%, 7%, and 10%. Control LMPs with 100% GDB were also manufactured for physical characterization. The LMPs were prepared using the MSC process by introducing a melt of the components onto a spinning disk. The LMPs were sieved to a particle size of 150 μm to 350 μm. Films of GDB and poloxamer labeled with Texas Red dye were fabricated by hot-melt casting. The LMPs and the films were annealed at 50°C/75% RH for up to 4 weeks and characterized before and after annealing using the following techniques: (1) confocal laser microscopy; (2) scanning electron microscopy (SEM); (3) Fourier-transform infrared spectroscopy (FTIR); (4) modulated differential scanning calorimetry (mDSC); and (5) dissolution testing. The goal of these tests was to determine the effect of annealing on phase separation of melt-cast films consisting of GDB and poloxamer. 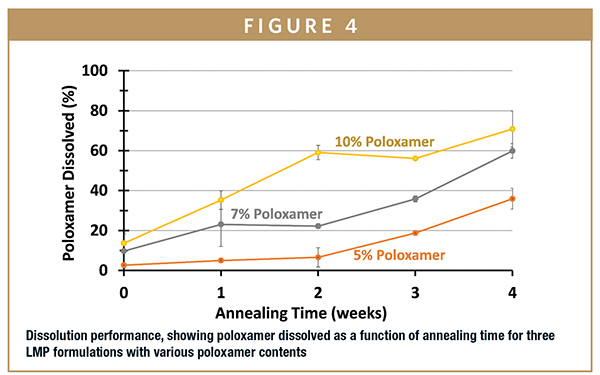 Melt-cast films containing 5% and 10% poloxamer were tested before and after annealing for 1 week. Labeling the poloxamer with the Texas Red dye made it possible to capture the internal rearrangement of the poloxamer after annealing. The goal of these tests was to determine if annealing produced observable effects on the surface of the LMPs. 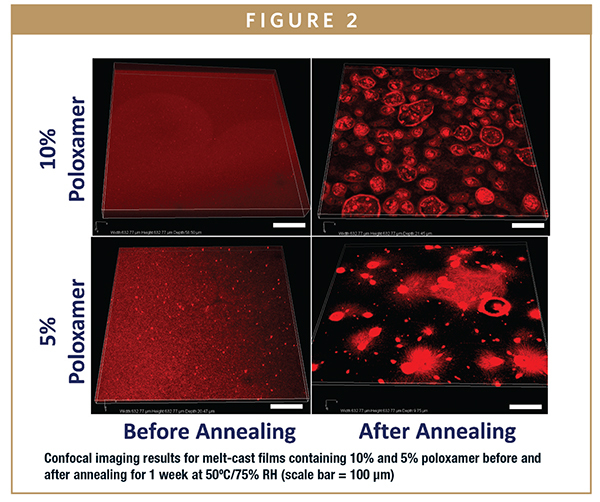 SEM images were taken before and after annealing of LMPs consisting of 100% GDB or LMPs with poloxamer contents of 5%, 7%, and 10%. SEM images revealed “blooming,” a characteristic of fats, on the surface of the LMPs after annealing at all annealing times and poloxamer contents (data not shown). 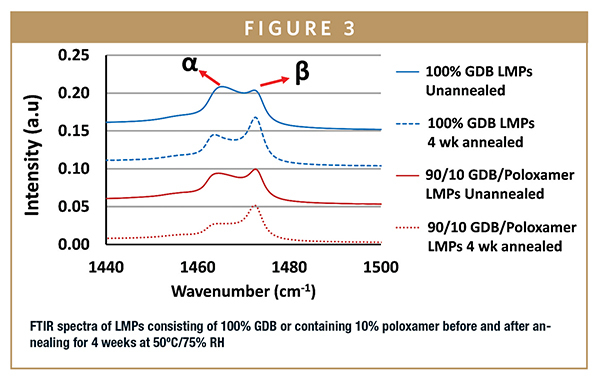 The surface coverage of blooms was greater for LMPs containing poloxamer than for 100% GDB LMPs for similar annealing times. The goal of these tests was to determine if changes in the thermal characteristics of the LMPs occurred after annealing. LMPs were tested for melting events and the melting-peak characteristics were analyzed. Results showed the enthalpy of fusion of the lipid peak increased with annealing time and that the lipid melt peak widened and increased with annealing time. The increase in melt enthalpy is attributed to formation of the more-stable β polymorph, and peak widening is attributed to existence of multiple polymorphs of GDB (data not shown). The results summarizing the physical changes that occur with LMP annealing and their effect on dissolution performance are illustrated in Figure 5.8 These results show that annealing can be used to accelerate kinetic transitions from high-energy polymorphs (present after LMP manufacture) to lower-energy polymorphs that are thermodynamically more stable. This transition should prevent changes in the dissolution profile of the LMPs during storage. Further, the studies showed adjustable drug release can be achieved by varying the ratio of dissolution enhancer to lipid matrix. This work investigated placebo LMPs (ie, with no API present in the formulation). In formulations with API, the mechanism of annealing is similar, but the rate of annealing varies. In one example with LMPs with low drug loadings, the drug dissolution rate and the enthalpy of fusion of the lipid melt peak stabilized after annealing for 2 weeks and did not alter upon further annealing (data not shown). Another example of LMPs with moderate to high drug loadings showed shorter annealing times of just a few days (data not shown). We hypothesize that the API, which remains crystalline through the manufacturing process, provides nucleation sites for lipid matrix crystallization, affecting the dissolution enhancer and lipid matrix organization and form. However, the annealing mechanism remains the same. These limited studies have advanced our understanding of the annealing process and its effects on physical and dissolution properties of LMPs and should prove invaluable in choosing the best annealing conditions for future controlled-release LMP formulations. In summary, LMPs are a promising technology for specialized formulations, including patient-centric (pediatric and geriatric) drugs that require adjustable-release characteristics. 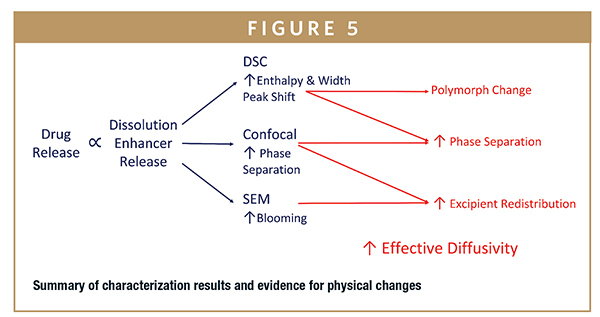 Drug dissolution from LMPs can be modified by varying the loading of dissolution enhancer. Optimal annealing conditions can be chosen to minimize any changes in LMP dissolution rate during storage. Annealing studies can thus be used to mitigate the long-term stability risks of deviating from the target product profile. Siew A. Solving poor solubility to unlock a drug’s potential. Pharm Technol. 2015a; 39(7):20-27. Siew A. A matter of taste. Pharm Technol. 2015b; 39 (9):34-38. Siew A. Stretching product value through reformulation strategies. Pharm Technol. 2015c; 38(10)24-30. Ivanovska V, Rademaker CMA, van Dijk L, Mantel-Teeuwisse AK. Pediatric drug formulations: a review of challenges and progress. Pediatrics. 2014; 134(2):361-372. Feeney OM, Crum MF, McEvoy CL, Trevaskis NL, Williams HD, Pouton CW, Charman WN, Bergström CAS, Porter CJH. 50 years of oral lipid-based formulations: provenance, progress, and future perspectives. Adv Drug Deliv Rev. 2016; 101:167-194. Leah Elizabeth Appel, M. D. et al. (2004), “Spray-Congeal Process Using An Extruder For Preparing Multiparticulate Azithromycin Compositions Containing Preferably A Poloxamer And A Glyceride,” Patent Applic. No. PCT/IB2004/003839 Public. No. WO2005053653A1. Lyon D. The mechanism of release of azithromycin from microspheres. Bull Technique Foundation Gattefossé. 2012; 105:106-112. Arora J., Prather C., Miller W., Saville S., Pluntze A., Craig C., Waybrant B., Pugh K., Shaffer M., Cape J. Annealing Effects on Lipid Multiparticulates for Pediatric Controlled Release. Poster presentation at the 2017 AAPS Annual Meeting and Exposition; November 12-15, 2017; San Diego, CA, Poster M4095. 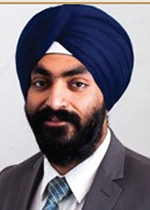 Dr. Jaspreet Arora, Senior Engineer, Product Development, Lonza Pharma & Biotech, is a chemical engineer focused on multiparticulate drug delivery. Presently, his work focuses on formulation, manufacturing, and analytical characterization of lipid multiparticulates (LMPs) for controlled release. 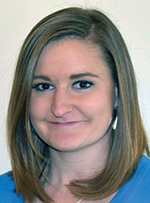 Samantha Saville, Scientist II, Lonza Pharma & Biotech, is an analytical chemist working with multiparticulate dosage forms for immediate release, modified release, and taste-masking applications. She uses USPII dissolution, assay, related substance, SEM, microtoming, EDS, HPLC, PION, appearance, and stability tests to determine drug availability and taste-masking. 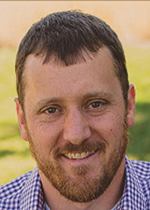 Dr. Brett Waybrant, Product Development Lead, Lonza Pharma & Biotech, is focused on multiparticulates, including lipid multi-particulates (LMPs) manufactured using the melt-spray-congeal (MSC) process and spray layered multiparticulates. His work encompasses formulation, manufacturing, and fluid bed coating of the multiparticulates for taste-masking, enteric protection, modified release, bioavailability enhancement, and pediatric applications.